Award-winning Nissan JUKE returns to Albuquerque in 2014 with new Red Alert and Bordeaux Black color choices, plus the exciting new NISMO model which debuted in spring of 2013. Muscular and fierce looking, JUKE gives off a bold, assertive vibe; an impression that solidifies when you experience JUKE's performance and handling. Not simply an SUV, JUKE is a sport crossover with motorsport-inspired styling, as evidenced in its gauges, center console and shifter. Juke's 1.6-liter direct-injection engine adds turbocharged power when needed and dials it down for better fuel economy when cruising. The JUKE seats five with 10.5 cubic feet of cargo space behind the rear seats; cargo capacity increases to 35.9 cubic feet with rear seats folded down. EPA estimated fuel economy is a satisfying 27/32 city/highway for the S, SV and SL front-wheel drive automatics. All Juke models offer Bluetooth hands-free connectivity and iPod interface, while the SV and SL trims add I-CON, an adaptive driver interface system for integrated control of various vehicle functions. Other convenience features include Nissan Intelligent Key, satellite radio and the Nissan Navigation system which is standard in the SL. The 2014 JUKE NISMO is endowed with nearly 100 individual revised components, from a NISMO-tuned 197-horsepower producing engine and NISMO-tuned suspension, to aerodynamic features enhanced to increase downforce by 37 percent over non-NISMO models. 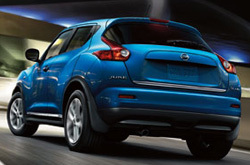 All JUKE models are available with all-wheel-drive. A solid choice, the JUKE was acclaimed by Kelly Blue Book and named 2012 best-in-class for Total Cost of Ownership, while the 2013 JUKE made Kiplinger's "best-of" list for fuel efficiency. 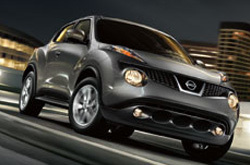 2013 also saw the JUKE making the Insurance Institute for Highway Safety's list of Top Safety Picks. Read on below for additional JUKE information and peruse our 2014 Nissan JUKE SUVs for sale in Albuquerque. We're here on Coors Boulevard to help you with questions about Nissan financing or leasing opportunities - so be sure to give us a call or stop by Reliable Nissan to see for yourself how it feels to drive a JUKE. The 2014 Toyota Matrix, Kia Soul, Mitsubishi Outback Sport, Mini Clubman and the Scion xB are exceeded by the 2014 Juke in many areas. The Juke's got several noteworthy qualities, including its handy incar technologies and tasteful looks. Many drivers in Albuquerque choose it because it's a remarkable value; compare its price to the vehicles listed above to see for yourself. Find out more - Look through the bullets below! Thank you for reading our complete 2014 Juke review, written by Reliable Nissan's expert authors. Stop worrying about your next purchase; look to the foremost Juke dealership in Albuquerque for well-researched reviews recorded by automotive enthusiasts. To make sound decisions when it comes to your next Nissan purchase, don't guess! Each overview is stuffed with facts, including info about vehicle features, in an easy-to-understand format. If the Juke isn't right for you, please review and compare Nissans other incredible vehicles now.